Mel's dream is to watch her children grow up and maybe one day spend time with her grandchildren. 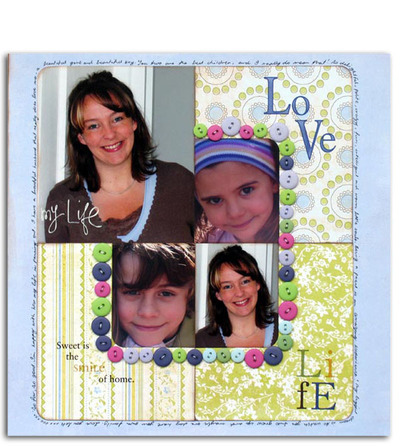 She chose to keep this layout simple with four photos - three smaller sized ones and then repeated the photo of herself and enlarged it to create a feature. Mel then added the SEI buttons, purely because she loves buttons! Hand journaling was added around the outside of the page. This is such an ace photo that Rachel Axton's husband took in her favourite spot in the whole world! She matched the background paper to her beanie and then just used strips of paper from the same range to layer up the background. Rach covered each of the flowers with patterned paper then added a bit of doodling! The layout is about her life where she has always followed her dreams, from living overseas in London, to owning a little beach house, to moving to Canberra to work in Scrapbooking!!! It is a reminder to always just 'go for it'. 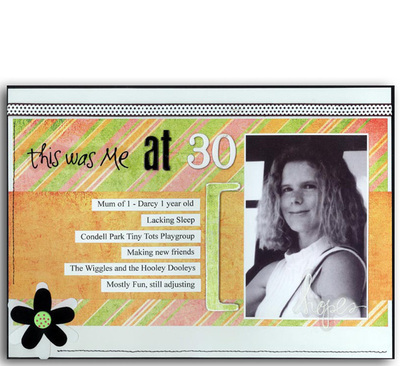 Nic Wright has created a layout to show what she was like at 18 and what she is like now at 28. Keeping the black and white theme adds a classic look. 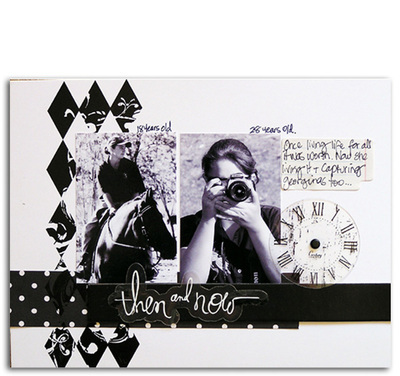 She has used the Heidi Swapp Onsert from this month For Keeps, adding it over the Heidi Swapp Black strip to make it stand out as the title for her page. The addition of a Heidi Swapp Ghost Clock adds to the feeling of time she is trying to convey on her layout. 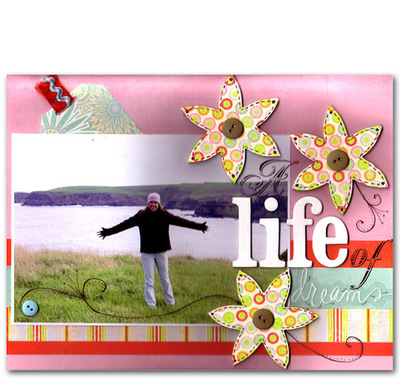 She has also used a mixture of Scenic Route papers and Heidi Swapp rubons in the background. The wiggling giggling of nearly four year olds makes it impossible to get a decent photo of them standing still. Right now they are slam bang in the middle of what Tamar calls BALLET STRESS - she's never experienced anything like it. All the demands involved with rehearsals that happen all weekend and the protocol for hair and costumes. Tamar wanted to document it in a light hearted way as she is sure the end result will be wonderful - it's just getting there that is the challenge. 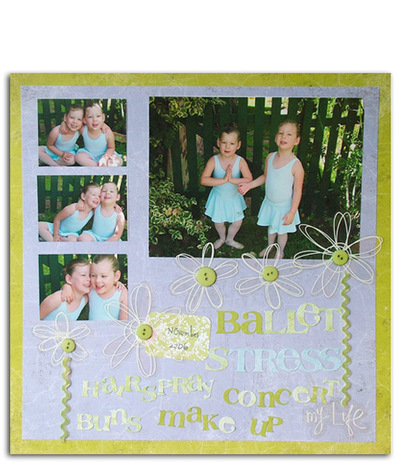 She has used the pretty plain coloured BG LilyKate as the basis for this layout and layered Heidi Swapp Flower Silhouettes in a scattered row to create a border against the " unstructured " journaling, a direct contrast to the aligned photos. She has also used the FK Onsert My Life at the base of the layout - the eye is drawn to it by the flower ribbon stem. 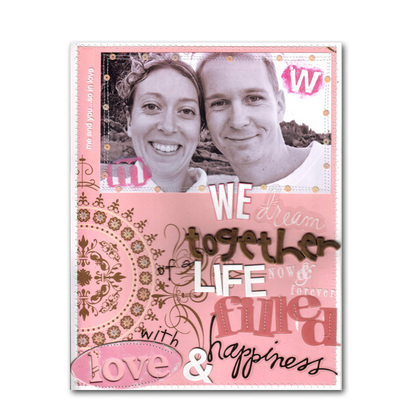 This layout purely came together because of the Heidi Swapp dream silhouette word included as part of the onsert in this months For Keeps. Marni was going to do a layout about her dreams but then she realised that there is more to her life than just her dreams so she decided to create a layout about her husbands and her dreams for the future. Marni used a lot of different lettering styles to create this layout and the thing she enjoyed most about it was being able to include whole words like dream, love and happiness and use different alphas to create the other words. Marni also used two Heidi Swapp mask letters to create the m and w on the photo. Before this layout she had never used them before as she was afraid of how hard they would be to use but after trying them out on this layout she has decided to use them more as they were easy to use and the effect they create is different and interesting. For those who have not used a mask before you simply peel them off the backing sheet place them where you want them and spread paint over the top and peel the mask away. A new child, a new life and a whole lot of new friends, this is what 30 meant to Caz. She and Darcy spent a lot of time at Playgroup and hanging out with the new friends they made there. She was introduced to the Wiggles, the Hooley Dooleys and Playschool, such an exciting time of her life. Lol. Caz chose some groovy BasicGrey papers, Basic Grey ribbon and covered a BasicGrey chipboard bracket for her next EDM page. She made her own silhouette using a transparency and Heidi alphabet. Heidi Swapp chipboard alphas, Queen & Co flowers and brads and machine sewing keep this months theme going.